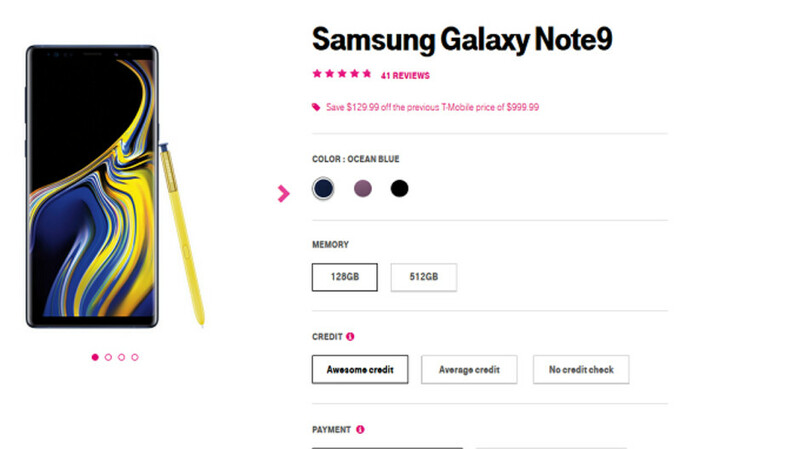 T-Mobile has just dropped the price of the Samsung Galaxy Note 9 by $129.99. That takes the price of the 128GB version to $870. The price of the 512GB version has been reduced by $130 to $1,119.99. At the same time, the carrier is offering 36 month financing for the Galaxy Note 9 as opposed to the usual 24 month plan. In combination with the price cut, you can now pick up the Galaxy Note 9 from T-Mobile for 36 monthly payments of $24.17. The 512GB model is also $24.17 a month over 36 months, but a down payment of $249.99 is required. T-Mobile has not implemented 36 month financing across the board, and is just testing this option for a couple of devices. It actually makes sense to go to 36 months since all indications are that U.S. consumers are now waiting longer before upgrading to a new handset. Most carriers used 24 months for financing since it fell in line with the old two-year contracts that phone buyers used to sign. Those were the days when wireless providers offered subsidies on new phone purchases. But with top-of-the-line flagship models now costing four figures, and carriers no longer subsidizing these purchases, U.S. consumers aren't so quick to jump to a new model every two years. Interestingly, T-Mobile was the first of the four major carriers to abandon subsidies and signed contracts. Back in 2013, it started offering its Equipment Installment Plan (EIP) inside T-Mobile stores. While AT&T Next does allow users to pay off a phone over 30 months, T-Mobile is the first to test a 36 month option. And the results of its testing will help the carrier decide whether to make 3 year financing the default option in the future. There's no interest, so it makes perfect sense. Even if you have all of the money upfront, it would be wise to take the installation. It keeps you more liquid & you can make a little extra interest on the money in your account. No Interest but price depreciation in 3 years will be big, on third year you basically paying $24/month for a phone that cost $350 BNIB (maybe note 9 cost that much on 2021). But it's still a good deal for anyone who don't mind using the a smartphone for 3 year and don't want to drain their bank account just to buy a smartphone. Depreciation doesn't matter if you don't plan on ever selling the phone. Well it doesn’t make sense making android phone cost as much as apple. The rage in pricing is insane. LMAO Iphones shouldn't cost what they do either. Don’t compare ios from android. It’s nit just the cost if devices that should be considered in pricing. How about design, specs, quality, services, maintaince, app store, marketing, and research and design cost. The fact that apple is still selling tons of $1000 phones means that they are price very well otherwise no one will gonna buy it. Why not Just because you what to do payments doesn't mean you can't afford it. Do or did you make payments on your house or your car. I have been paying cash for our phones now with the last 2 we have bought. I use to do payments, didn't mean i couldn't afford it. Last time I noticed on T mobile.com the 512gb was not $300 off. It was never $1,419.99. https://www.t-mobile.com/cell-phone/samsung-galaxy-note9?color=oceanblue&memory=512gb Its $130 off. Alan, that's who. The one writing the article lol. It's simple, he edited the article, after I noticed his error. Guessing, you have never made an error when writing? Simple, logic would suggest, I posted what I did for a reason. Hence, posting 2 HRS before yours. Surely 36 months you would end up paying a lot more than the standard 24 months. No you don't. It's still 0 interest. Note 9 is still better then that ugly Sony, the back of that phone is ugly . And that sony is also running android 9. LMAO Keep dreaming little boy. These are the reasons why this is happening: Flagships are too costly, not selling well, most are skipping the 9 & waiting for Galaxy X (10). I mean let's get real, not everybody can shell out a grand for a phone. Flagships used to cost $500-700 a couple years ago. Thousand dollar phones just shows how ridiculous and out of touch these companies are sometimes with the consumer market. I think this is a very good idea. No down payment and $24 sounds much better than $40 a month and after 2 years if you want to upgrade you paid off $580 and you gonna owe $290. I think the note 9 would worth $290 after 2 years. So you can pay it off with a Credit card and sell it.